“In my experience, most people are shocked to discover organic growers do use pest control chemicals – just not chemicals that were developed by people and don’t occur in nature,” writes Dr. Adrianne Massey. While it may come as a surprise, most writers don’t like getting mail pointing out their mistakes. But every once in a while someone does it in a way that makes you glad they took the time to write. Dr. Massey is well acquainted with claims organic producers make about pesticides in conventional agriculture. Much of her time is spent speaking to farm and consumer organizations and answering the GMO-bashing that seems to come from environmental activists on a daily basis. She began her professional career as a biological sciences faculty member at North Carolina State University and then joined the North Carolina Biotechnology Center where she led the Center’s education, work-force training and public outreach programs. She has co-authored three textbooks on biotechnology and serves as science advisor for the weekly PBS series, Breakthrough. She sent a link to a list of pest control chemicals approved for use in organic production systems, which can be found on the USDA National Organic Standards website: https://www.ams.usda.gov/rules-regulations/organic/national-list. She also sent links to articles: http://n.pr/1jxgJsw and http://bit.ly/1TFEcp1 discussing how misleading claims about no pesticides in organic food can be. In one, “Organic Pesticides: Not an Oxymoron,” which appeared on the NPR website, Maureen Langlois notes how a USDA report that nearly 20 percent of organic lettuce tested positive for pesticides piqued her interest. Also of interest were her findings approved pesticides including pyrethrin, azadirachtin and spinosads are also considered toxic by EPA. I don’t mind being told when I’m wrong; I wonder if organic activists feel the same. An ENDURE team of 17 co-authors has just published a review paper on the European Union’s eight principles of Integrated Pest Management (IPM). The paper provides researchers, advisers and farmers with an approach for applying these legal requirements intelligently to promote local innovation while reducing reliance on pesticides and associated risks. The authors hope that interest in this approach may help garner support from European and national policy makers to set incentives promoting IPM extension work, demonstrations, research and implementation. Rather than searching for a universally applicable silver-bullet solution, the authors argue in favour of a broad approach that takes local specificities into account and allows all farmers to engage in IPM at any point within the continuum. Their vision stems from the realistic acceptance that pesticide-based crop protection is simple and efficient in generating spectacular short-term results. More sustainable alternative strategies will inevitably be more complex and knowledge-intensive in their initial development stage. The process envisioned therefore requires learning, adaptation, and tweaking of a number of farm management practices. It requires extending the challenge of crop protection to larger spatial and temporal scales, and generating more complex cropping systems better adapted to the local context. It also requires attention to non-technical aspects such as the social environment in which farmers operate, collective learning and farmers’ inclination for step-wise rather than drastic changes. But the approach is viable, and the authors offer real-life examples of successful experiences with the types of tactics and strategies suggested. The authors note that 70 years of reliance on chemical protection has led to the development of cropping systems that have become inherently vulnerable to pests. By emphasising Principle 1 on prevention, the authors offer concrete illustrations on how to modify cropping systems to make them more robust in the absence of pesticides. The authors also identify the limits and opportunities associated with Principles 2 to 7 – a logical sequence starting with observation and ending with using chemicals as a last resort. Last but not least, a new slant is given on the question of evaluation (Principle 8) regarding the need for the development of new performance criteria and their routine use among the farming community. Principle 2 – Monitoring Harmful organisms must be monitored by adequate methods and tools, where available. Such adequate tools should include observations in the field as well as scientifically sound warning, forecasting and early diagnosis systems, where feasible, as well as the use of advice from professionally qualified advisers. Principle 3 – Decision-making Based on the results of the monitoring the professional user has to decide whether and when to apply plant protection measures. Robust and scientifically sound threshold values are essential components for decision-making. For harmful organisms, threshold levels defined for the region, specific areas, crops and particular climatic conditions must be taken into account before treatments, where feasible. Principle 4 – Non-chemical methods Sustainable biological, physical and other non-chemical methods must be preferred to chemical methods if they provide satisfactory pest control. Principle 5 – Pesticide selection The pesticides applied shall be as specific as possible for the target and shall have the least side effects on human health, non-target organisms and the environment. Principle 6 – Reduced pesticide use The professional user should keep the use of pesticides and other forms of intervention to levels that are necessary, e.g. by reduced doses, reduced application frequency or partial applications, considering that the level of risk in vegetation is acceptable and they do not increase the risk for development of resistance in populations of harmful organisms. Principle 7 – Anti-resistance strategies Where the risk of resistance against a plant protection measure is known and where the level of harmful organisms requires repeated application of pesticides to the crops, available anti-resistance strategies should be applied to maintain the effectiveness of the products. This may include the use of multiple pesticides with different modes of action. Principle 8 – Evaluation Based on the records on the use of pesticides and on the monitoring of harmful organisms the professional user should check the success of the applied plant protection measures. Arjun Neupane, a farmer in Dhaibung, Rasuwa, owns a farm that’s all organic. His prize produce is tomatoes, and they grow in a plastic-roofed shed that’s surrounded on all sides by marigold plants. The rest of his farmland, used for growing cauliflower and spinach, is spotted with plastic drums that house a slurry of buffalo dung and urine mixed with titepati, neem and sisnu leaves. It’s the employing of slurries of this kind that’s at the heart of a farming method called Integrated Pest Management (IPM)—a method that’s been adopted by a growing number of organic farms in all districts of Nepal. The IPM philosophy is a simple one: It’s a way of using, as much as possible, plants (mostly those that grow in the wild) and animal waste to keep pest numbers down and fertilise the soil at the same time. The buffalo urine in the slurry, which Neupane ferries by the bucketloads to his vegetable beds, acts as a fertiliser—by adding nutrients such as ammonia in its natural form to the soil—and the plants used in the slurry kill germs and keep away animals such as rodents, with their bitterness. 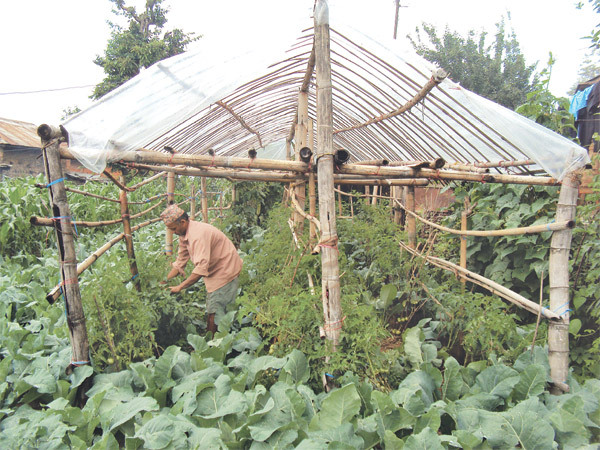 Live plants, too–such as the marigold plants around Neupane’s greenhouse—can be marshalled as a defensive front: in Neupane’s case, they keep at bay the nematodes, a kind of worm, which would otherwise prey on his tomatoes. IPM took off in the late 90s in Nepal, with the government’s encouraging farmers to make use of the method as an alternative to depending on chemical fertlisers, which are harsher on the soil and whose use over time can lead to the land’s turning effete. The government knew that it had to wean the farmers off chemical fertilisers if they wanted to preserve the farmlands’ soil. The advent of globalisation had by then seen a marked increase in Nepali farmers’ switching to various types of chemical fertilisers and pesticides, which had become readily available in all markets across the country. And the farming sector had transformed from one which primarily used organic fertilisers and biological agents to one that relied increasingly on fertilisers that degraded the soil quality of the farms and which furthermore had untold adverse effects on the environment and in turn on public health. Most farmers who use only chemical fertilisers are locked in a vicious cycle. The chemical fertilisers produce better yields, and as most other farmers now opt for using chemicals (even as they further degrade their land), they have to keep up if they want to compete in the marketplace. Furthermore, many of them have also taken to using industrial-strength pesticides to keep away pests—such as insects, disease-bearing pathogens, weeds, rodents, and mites—which are the major constraints to increasing agricultural production and which can cause productivity losses of up to 40 percent. This increase in the use of chemical pesticides ends up not only upsetting the natural balance of chemicals of the soils in the fields, but also leads to an increase in the populations of secondary pests. It was to help those farmers who wanted to get back to using biopesticides that the concept of the IPM approach was pushed by the government. The first phase of IPM farming in Nepal was launched just before the turn of the century by the Department of Plant Resources, under the Ministry of Agriculture and Cooperatives. The government was aided in its venture by various developmental partners and together they helped set up the practice for farmers in various districts, including Jhapa, Morang, Bara, Chitwan, Kapilvastu, Bardiya, Banke, Kailali, Ilam, Kavre, Syangja, Surkhet, Dadeldhura, Tanahu, Dhading, Mustang and Manang. Ironically, the government had to sell the idea as a ‘modern’ method of farming, even though local versions of IPM were what the farmers used to work with before the farmers switched wholesale to chemical fertilisers. Wood ash, for example, has been widely used for pest control in west Nepal for generations. Today, the national IPM Programme seeks to teach the farmers how to find their way back, says Yubak Dhoj GC, a government official and former coordinator at the Plant Protection Directorate. To help farmers make the switch, the government and various non-governmental agencies have set up IPM farmer schools all across Nepal, in which farmers such as Neupane learn the science of using botanical pesticides, which can be made from more than 50 plant species readily available in Nepal: plants such as neem, marigold, titepati, sisnu, garlic and timur are used in IMP to ward off pests such as the cabbage butterfly larvae, hairy caterpillars, cutworms, red ants, termites and aphids. Today, it is estimated that around 11,000 farmers in 17 districts have completely adopted IPM techniques and that the number is increasing at the rate of more than 10 percent each year. Thus there are quite a few farmers who are getting sold on the idea, but there still remains the challenge of helping the IPM farmers compete with those who still haven’t given up the use of chemical fertilisers. The IPM model requires more man-hours in the field; furthermore, as Neupane, says, it’s difficult for IPM farmers like him to compete with farmers who use chemical fertilisers, andwhose tomatoes look larger, redder and juicier than his. According to GC, the IPM programme is at a crossroads now. He says the government has to play a larger role in helping farmers such as Neupane. At present, the agricultural produce grown using chemical fertilisers and the IPM methods are competing in the same markets. The government doesn’t have the mechanism in place to certify certain products as being organic. If that were to happen, Neupane thinks that he could sell his tomatoes to hotels in Dhunche, where the tourists who prefer organic produce could seek vegetables like the ones he grows. In cities like Kathmandu, there are already many farmers who are able to sell their products in the niche markets that the organic farmers, who employ IPM, have carved for themselves. For the farmers outside the Valley, the main draw of IPM farming is that the soil will remain fertile in the long run. These farmer can only compete with those who use chemical fertilisers, says GC, if the government were to provide subsidies and help improve market access for them. “We have been successful in involving the farmers in the IPM approach but have failed to improve the accessibility to the market for their products. Thus it’s still difficult for most of them to benefit from the agriculture practice they are adopting,” says GC.